An electronic Medical Record (EMR) is defined as "an electronic record of health-related information on an individual that can be created, gathered, managed, and consulted by authorized clinicians and staff within one health care organization." People tend to use the phrases "electronic medical record" and "electronic health record" interchangeably, but in truth, there are quite a few differences between the two. Perhaps the most significant difference is that an electronic medical record is limited to the data collected and maintained on a particular individual in one single medical practice or health care system, and intended to be used primarily for the convenience of the staff within that practice. 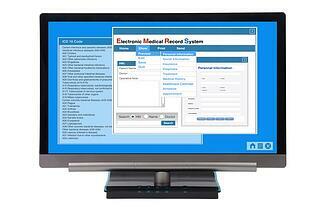 In short, an EMR is an electronic version of the paper chart. Unlike EHRs, electronic medical records systems are usually designed around the unique workflows of a particular practice; that's why you'll see Pediatrics-specific EMRs, or Cardiology EMRs, for example. These specialty-specific EMR systems include templates and features that simplify the care delivery, documentation, and billing processes unique to a specialty practice. EMRs are not designed to travel with the patient from one provider to the next, they remain with—and are managed by—the practice that created them. EMRs have actually been around for a long time; they were introduced in proto form in the 1960s as part of the earliest hospital administration data-processing systems. The first official electronic medical record was released in 1972 by the Regenstreif Institute, but the concept failed to gain traction, despite being endorsed in 1991 by the Institute of Medicine. It wasn't until Congress passed the HIPAA law in 1996 that the industry turned to electronic records to comply with provisions in the law. Of those physicians who have adopted an EMR, only about 74% are using certified software products; 51% of physicians surveyed reported only using the most basic functions in their systems. Monitor a patient's diagnoses and treatments over time. Identify patients who are due for routine health services such as mammograms or immunizations. Measure patients against benchmark parameters such as blood pressure readings or BMI. Improve quality of care for individual patients as well as specific patient populations within a practice. Reduce the incidence of medical error, duplication of tests, and treatment delays. To summarize, then, an EMR is an electronic version of the paper chart that simplifies and automates data collection and organization, as well as care delivery, for a particular doctor or medical practice.